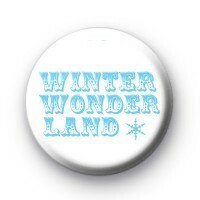 Blue Winter Wonderland Badge in white with Winter Wonder Land written in a festive snowy font. Also features a lovely blue festive snowflake. Our Christmas badges are really popular in December & are perfect for teachers to give out to students in school. We have a great range of Xmas badges available in our Christmas badge category, with over 450 designs to choose from. We also have a lot of varieties of Christmas snowflake badges available so be sure to check them out. Standard 25mm badge made in our UK workshop.